Two volunteer groups active in Akan-mashu National Park: the Akan Lakeside Park Volunteers, who are active mainly in the Akan lakeside area; and the Mashu/Kussaro Park Volunteers, who are active mainly in the area surrounded the Mashu and Kussharo Calderas. 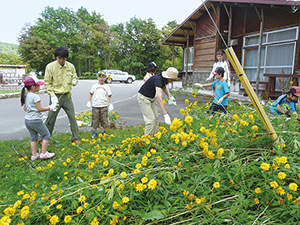 Volunteer activities include assisting at observation meetings held by the Eco Museum Center, conducting surveys of the natural environment within Akan-mashu National Park, and carrying out clean-up activities. Volunteers also assist with the maintenance and management of park facilities, such as repairing or cutting grass along mountain trails. 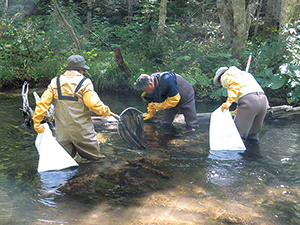 The Green Worker Program (Special Programs to Engage the Public in Nature Conservation Activities in National Parks) is a program aimed at improving park management levels by engaging people who are familiar with the nature and social situation of the region to carry out flora and fauna preservation, environmental beautification, maintenance and management of park facilities, landscape conservation, surveys, and other activities. In Akan-mashu National Park, volunteers carry out control activities and educational activities regarding control of invasive species, as well as surveys of Lake Akan and nearby lakes and reservoirs.